There were 75 total entries including the few that answered the question right for an extra 5 entries. The correct answer was that they had just celebrated their 25th anniversary. I plugged the number 75 in Random.org and let it go. 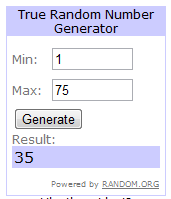 The random number that was generated was 35 and the winner ended up being Patrick from The Courage of Lungs due to his correct answer of the bonus question as the winning count off ended directly in the middle of his 5 extra entries comment. Congratulations Patrick, and thank you for being a regular reader and commenter on 26.2 Quest! Please contact me at info@262quest.com with your mailing address and we will get your new sunglasses over to you! If you don't already know Patrick you need to go over and take a look at his blog and subscribe while you are there. If you are more the Facebook type you can also hit up his Facebook Fanpage or he even tweets at @PatRuns. Thanks for stopping by, reading, and commenting!